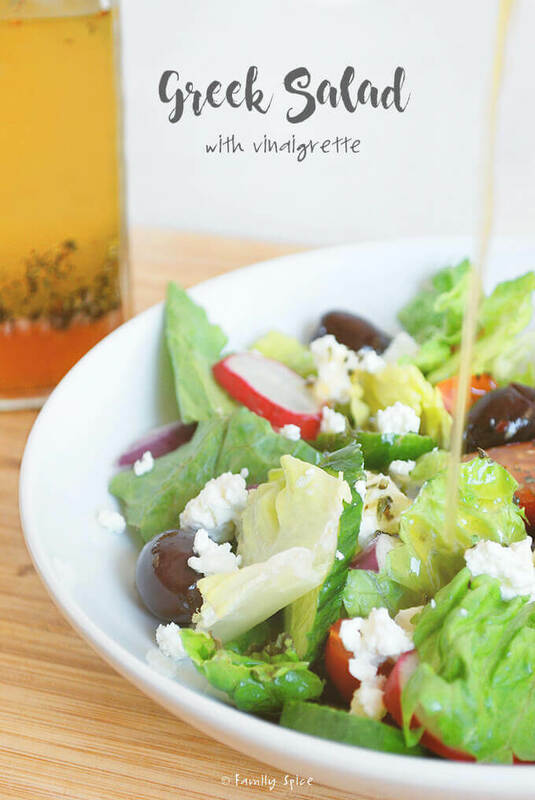 This version of the Greek salad highlights the flavors of the mediterranean: olive oil, basil and feta cheese. I admit that I am not big on salads. Especially for a meal. Not that I don’t like vegetables, I do. It’s just that salads don’t fill me up. Every night, we prepare a green salad to eat with our dinner. Two out three kids love salads, especially when it’s crunchy and has plenty of condiments (cucumbers, tomatoes, olives…). 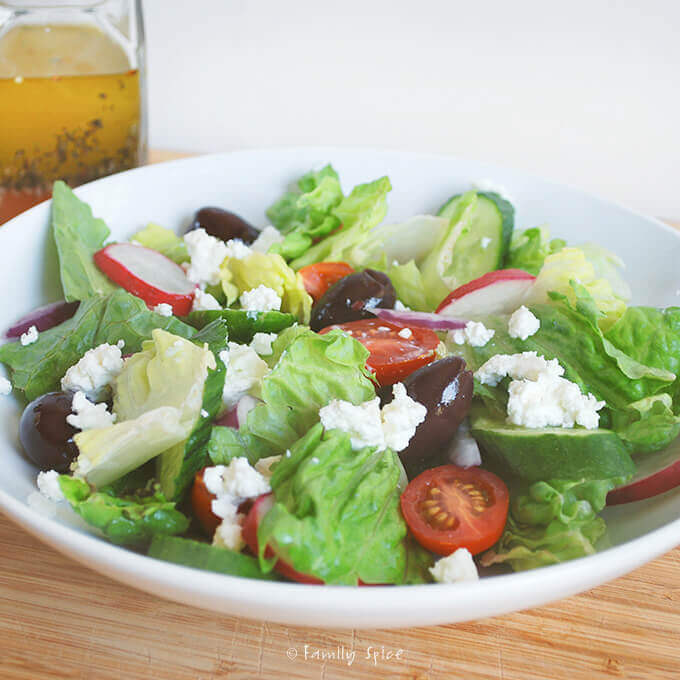 There is one salad that I am totally into, and that’s the classic Greek Salad. There’s something about the salty-creamy feta and the tangy dressing that wakes up my salad taste buds. 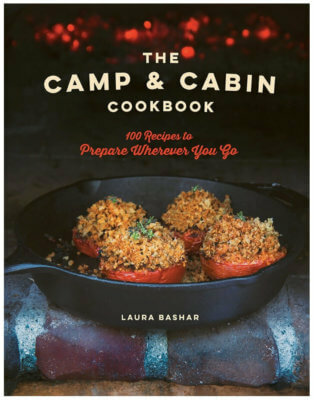 This month for Barefoot Bloggers, Tara of Smells Like Home chose Ina Garten’s Greek Panzanella. This is a bread salad with a Greek twist. Although it looked delicious, I knew that my posterior didn’t need any more carbs, so I chose to make my Greek Salad instead of totally blowing off this month’s challenge recipe. 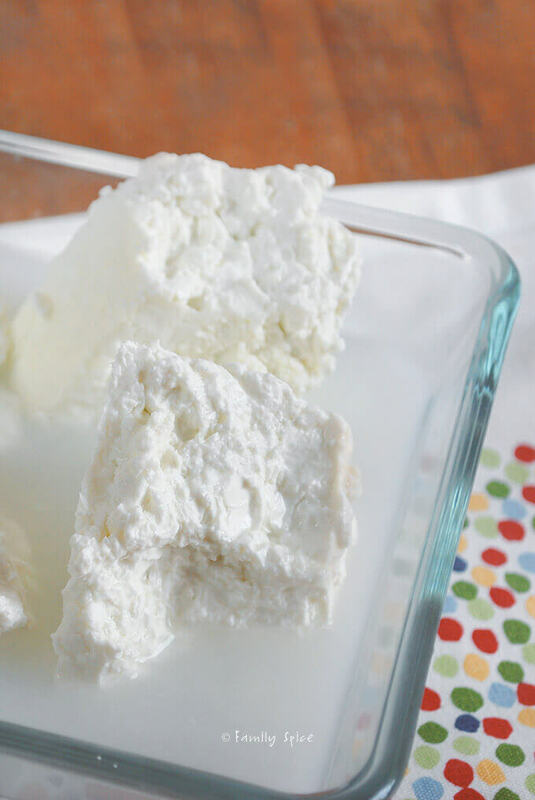 I am partial to Bulgarian feta, which is the creamier cousin in the feta family. It is typically stored in a salty water to keep it moist and fresh. Ina’s vinaigrette uses dijon mustard, while I use a combination of red wine vinegar and freshly squeezed lemon juice. Toss with romaine lettuce, tomatoes, cucumbers, red onions and radishes and topped with Kalamata olives and feta, and I’m in heaven. My hubby doesn’t care for feta in his salad, but my little Princess and I can share a giant bowl of this together. Of course, I have to give her all the olives because she loves them so (I sneak a bite of olives when she’s not looking). Serve salad with prepared salad dressing. Serving Suggestions: Great for a meal or as a side salad. 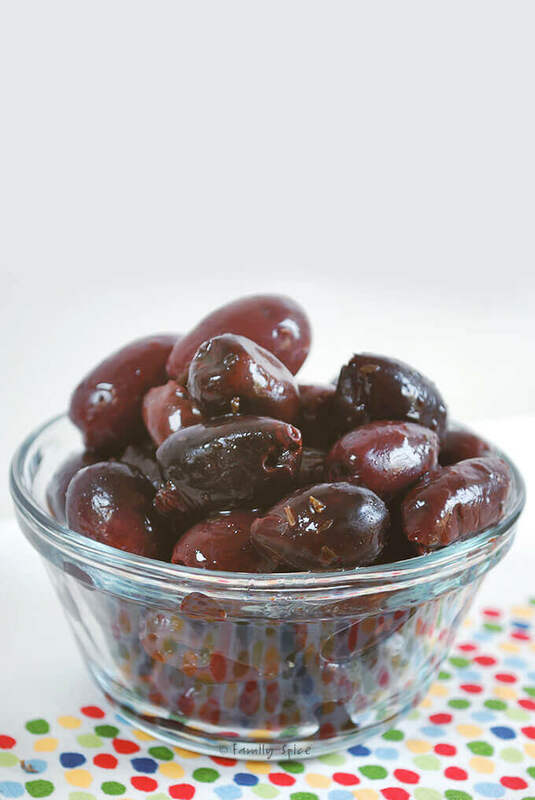 Add some leftover chicken, steak or shrimp to make it a delicious and healthy dinner.You can also substitute olives with artichoke hearts or peperoncinis. For more zing, add red or yellow bell peppers. Lovely photos! I thought Ina's salad was fantastic, but I can understand wanting to take it easy on the carbs. I've been enjoying too many summer desserts!